"This recipe is great for leftover beef roast! Mmm, beefy!" Place potatoes and carrots in a medium saucepan and fill with water to cover. Cover and cook over medium high heat until almost done (about 10 to 15 minutes). Drain and let cool for a few minutes. In a medium bowl combine the potatoes, carrots, onion, beef, gravy, bouillon and seasoning. Season with salt and pepper to taste and mix all together. In a large bowl combine the baking mix, milk and egg and mix together until smooth. Pour beef mixture into an ungreased 9 inch deep dish pie plate. Pour pastry dough on top. Bake in preheated oven 25 to 30 minutes, until crust is golden. 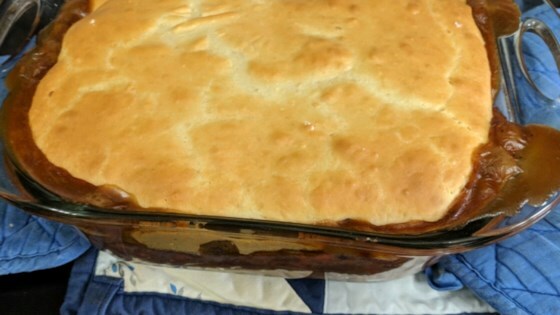 See how to make a simple pot pie with beef and all the veggies. Tasted like the inside of a low priced frozen pot pie. My preference is quick but tastes like you spent a lot of time. Try it if you like the frozen! Will definitely make this again. Added celery, garlic, and frozen peas as was suggested. Threw in some McCormicks steak spice. Husband liked it!